Declan Kiberd discusses Inventing Ireland (Convergences: Inventories of the Present). Gerardo Gambolini has translated a range of Irish books into Spanish, from John Mc Gahern's Collected Stories to Declan Kiberd's Inventing Ireland. Join him and Declan Kiberd as they discuss some of the challenges posed by translation. Ireland Literature Exchange is the national agency for the promotion of Irish literature abroad. It does this primarily by offering translation grants to international publishers. Copies of the translated work are donated to the National Library's collection. For the months of July and August, the Library will display a selection of books by Irish authors that have been translated. This selection includes a wide variety of work, ranging from Samuel Beckett's dramatic works in Hebrew to Pádraic O'Conaire's Deoraíocht in Vietnamese. 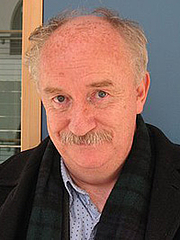 Declan Kiberd is currently considered a "single author." If one or more works are by a distinct, homonymous authors, go ahead and split the author. Declan Kiberd is composed of 2 names. You can examine and separate out names.